A dear friend of mine, who shall remain nameless (you know who you are) contacted me a couple of weeks ago. She also makes cakes for people, and she has one customer in particular for whom she makes a 6" italian cream cake every year for her wedding anniversary. Unfortunately, my friend was going to be out of town and wasn't able to make the cake this year. I agreed to make the cake and deliver it for the stellar price of $15. After all, it was a favor for a friend, right? So today is the day I am to deliver this cake. Kids are home, it's rainy outside, and everybody's a little whiny and cabin feverish. After finally getting the kids dressed, cake boxed, and address in the GPS, I am frantically searching for my hat (definitely a hat day, folks.... too much rain and not enough product for this hair to be hatless). I see my hat in the office, grab it and put it on quickly as we're walking out the door. We are about two blocks from the delivery address when I notice the flashing lights in my rear view mirror. Crap! I couldn't believe I was getting pulled over and would most likely get a ticket for something while delivering this $15 cake to Pflugerville. As the officer approaches the car, my kids are bellowing "are you gonna go to jail, Mom? I don't want you to go to jail... who will take care of us?" The officer was very polite, informing me that I had no inspection sticker on my car. What??? I knew there was something wrong because I had my car inspected in April. Then the humiliating truth reared it's ugly head.... I did, in fact, have my car inspected in April. I also renewed my registration in June (which had expired in May, btw). Apparently, when applying my new registration sticker... rather than remove the expired registration sticker, I had removed the current inspection sticker. So now I'm driving around with an expired registration sticker, a current registration sticker, and no inspection sticker. I was able to find my receipt for the inspection, so the officer was very kind and gave me a warning. As a bonus, he gave the kids each a coupon for a free ice cream cone because they were properly seated in their booster and car seats. I arrive at this lovely lady's house to deliver the cake. She's very kind and appreciative as she takes the cake and gives me the $15.... All the while, however, she is looking at me rather strangely. I figure I must look like someone she knows or something. I thank her and head back to the car. When I get to the car I notice something odd on my hat in my reflection in the window.... then I notice my hat! I thought I had grabbed my Texas State Aquarium hat... an unassuming, neutral colored hat with very little embellishment. The hat looking back at me was anything but unassuming. This was a hat my dad had bought shortly after the most recent presidential election. This was an Obama Hat.... Em-blazed with vibrant red, white and blue embroidery with "Obama" hugely written across the front. 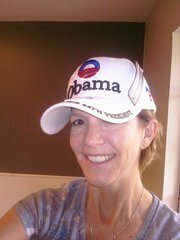 Now don't get me wrong, some of you may find this offensive but I actually am an Obama supporter.... this is just an outrageously ornate hat and one I would never choose to wear regardless what the words on the hat were. And it was one of those "tall" hats. You know the kind I'm talking about... they look like you're smuggling something on top of your head under that hat. But here it is folks.... the final humiliating blow to the tiny fragments that remained of my dignity..... The tags were still on the hat.... hanging from the top. And not small tags, either... big tags... at least 4 inches long and 1-2 inches wide. And this is how I looked when the officer pulled me over... and the lady accepted the cake from me. I replayed my encounter with the police officer and the lady I delivered the cake to... what must they have thought of me. Probably thought I was off my nut.